Here is a picture of the painting I created in almost record time (less than a week) for Allyson Seconds' birthday this -OK, technically last- year. Allyson is a singer/musician and loves bats, hearts and milagros. 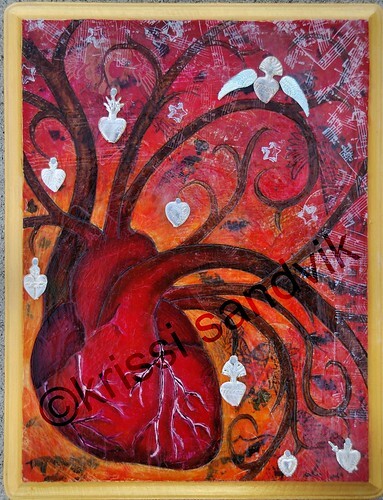 She is also my personal trainer, but aside from the heart itself, that imagery will be saved for another painting. "A Girl and her Cat" is a piece I seem to have been working on FOREVER. It gave me quite a bit of trouble since I kept going after I should have stopped. I ended up sanding the background down and building it back up again. What a nightmare. 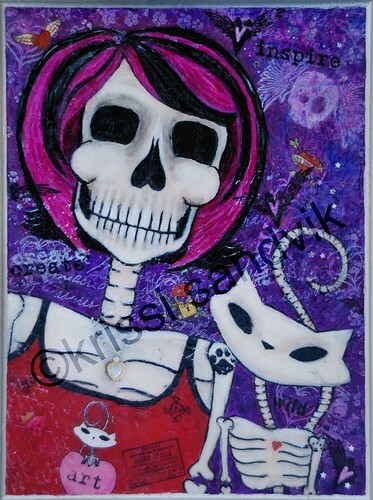 Anyway, my skele-likeness and Skelekitty are now on their way to Atlanta, GA and the "Not You" self-portrait show at the MINT Gallery curated by my pal and fellow artist, Travis "Mr. Purty" Smith. Finally, as many of us mourn the loss of David Tennant as "The Doctor," I offer you a little piece of cuteness in progress from the 2008 season to help cheer you up. 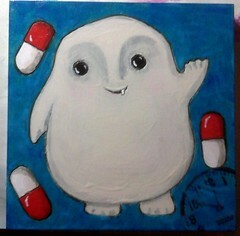 I've decided to sell this painting of an ADORABLE little fat cell on Artfire when he's all finished, and I fear that there may be something of a scramble when he finally gets listed.